As many of you know, we are located in Texas. Even though we were not affected by Hurricane Harvey, we have several friends who were. Please consider donating to the following charities to help those who were impacted rebuild their lives in the wake of this disaster. Thank you. Please feel free to leave any comments, questions or suggestions below or on the YouTube page for this episode. 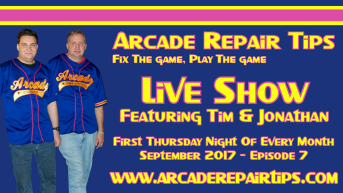 As always, you can contact us when we are off the air by email at questions@arcaderepairtips.com. Enjoy! Special thanks goes to David Vaughan for composing all of the great chiptunes music that we use in our content and Nathan Knight for providing our excellent voiceovers. Please check out their websites for information on the services they provide.